The Kootenays hold colossal secrets — the kind that end in a discovery you’ll want to share. And while some of the secrets listed below are well-known in certain circles, read up: you’ll likely find (or learn) something new. Without further ado, the following are 25 things with big reputations, big thrills, or big views that can be found in the Kootenays. Have you checked off any of these? Crossing Kootenay Lake between Balfour and Kootenay Bay, this ride is the longest free scenic ferry in the world. You can sit in your car while crossing, but with seats on deck and a view that is 360-degrees of spectacular, even travellers in winter get out to catch a glimpse. A mecca for outdoor recreation lovers, this mountain range in the Purcells draws climbers the world over thanks to the range’s massive granite spires that rise up out of the glacier below (see top/cover photo). Most hot springs in Canada occur in British Columbia, and the Kootenays is blessed with one of the highest concentration of these natural mineral pools (from wonderful resorts to wilderness backcountry pool). Soothe your spirit in these legendary natural mineral pools! The birth of heli skiing took place in 1965 by Hans Gmoser, Canadian Mountain Holidays (CMH). While, cat skiing was pioneered in 1975 by Allan and Brenda Drury, Selkirk Snowcat Skiing (formerly Selkirk Wilderness Skiing) is located in the small community of Meadow Creek (north of Nelson). Today, the Kootenays is home to 14 Cat and 18 Heli Ski operators in the region. The Kootenays is home to four national parks and over 75 provincial parks. Canada’s natural treasures are protected forever in these parks. Yoho and Kootenay National Parks and Mt. Assiniboine Provincial Park are included in the Canadian Rocky Mountain Parks UNESCO World Heritage Site. Plus, you’ll find roadside picnic spots, vast areas of unspoiled wilderness and everything in between. The first time I saw the Columbia River snaking through the valley near Invermere, BC, I had no idea it was the the same mighty river that flowed to the Pacific, the same river that Lewis and Clark once explored. All I knew was that the way the sun and clouds played with the snaking water was spellbinding. Later, on a roadtrip in the same area with a native British Columbian, I learned I had been standing near the headwaters of the fourth largest river in North America. Now you’ll know when you go. This 17,000-acre area along the Kootenay River protects habitat for over 300 species of birds. It’s also home to nearly 100 other, non-avian creatures, including one of only two known breeding populations of the northern leopard frog in BC. If you want easy access to BC’s famed old-growth cedars, this stop, right along the highway in Mt. Revelstoke National Park, is the place to come. A boardwalk with interpretive signs winds through 500-year-old cedars; their imposing presence makes you feel ages away from the present day. The Great Divide Trail, called ‘one of the most spectacular and challenging long‐distance trails on the planet’, travels through the Rocky Mountains that make up the lower provincial border between Alberta and British Columbia. Roughly half of the 1100-km trail traces the Kootenay section of the Rockies, crisscrossing back and forth as it works through a vast mountain wilderness. Famous with Kootenay locals, the name speaks for itself. The mountains and glaciers that make up this mountain scene dwarf everything below them, including the larches, wetland area and hikers that stare up from below. The valley is accessible via logging roads north of Kaslo and west of Invermere. A via ferrata will have you literally clinging to the side of the mountain. If that’s your cup of tea (and for many visitors to the Kootenays, it is), then you’re ready for the via ferratas at Kicking Horse Mountain Resort and CMH’s Bobbie Burns Lodge (all three are located in our Purcell Mountains, near Golden). With Mt. Nimbus with CMH offering North America’s longest Via Ferrata. About half of BC Hydro’s total power generation comes from the Columbia River region in the Kootenays, and within that region, the two largest dams are the Mica and Revelstoke Generating Stations. The Mica dam stands 244-metres above ground while the Revelstoke reaches 175-metres in height. The latter has a seasonal visitor centre that showcases First Nations galleries and interactive displays. Located within the roadless Mt. Assiniboine Provincial Park, this mountain is nicknamed the 'Matterhorn of the Rockies' because of its resemblance to the pyramid-esque peak in the European Alps. Landscape photographers from all over the world hike in to capture the 3,618 metre spectacle looming above Lake Magog at its base. Named after Donald A. Smith who, in 1885, drove the last spike in the coast-to-coast Canadian Pacific Railway, this peak is the highest along the entire Trans-Canada Highway in Glacier National Park and regarded as one of the 'Fifty Classic Climbs of North America' by the climbing and mountaineering community. Though sites rank this Selkirk peak anywhere from the 12th highest peak in BC to the 21st highest peak, one thing is certain: In Canada, Mount Sir Sandford ranks in the ‘top 10’ for the county’s ultra-prominent peaks. To make this list, a peak must reach or exceed 1,500-metres in height (or prominence) above its surroundings, including the summits of surrounding mountains. In short, Mount Sir Sandford commands attention on the skyline. When ‘The 100 Best Small Art Towns In America’ was published—which includes Canada’s best, too—it gave Nelson, BC top billing for Canada. Locals know that the creativity extends beyond the town proper, reaching west to the Slocan Valley and north to Crawford Bay. With over 3,125,460-acres and 80 ski operators serving up deep, dry powder, the Kootenay region is belted in by all the elements needed to deliver top notch product for snowsports enthusiasts year after year. For skiers and snowboarders everywhere, this translates into the Kootenay region being one of the world’s most sought-after powder meccas. If you want the most vert of your friends next winter season, get your pass at Revelstoke Mountain Resort and get your legs ready for the laps; the resort holds the title for North America’s greatest ski resort vertical at 1,713-metres. Not only is this a popular place for modern-day backcountry skiers, but it’s also claimed as the birthplace of North American mountaineering in the late 1800s. Located in Glacier National Park, Rogers Pass was once frequented by those who built — and later rode — the Canadian Pacific Railway through the area’s glaciated mountains. It naturally follows that the human spirit, led by the adage of “I climbed it because it was there” would spark up the curiosity of those who hoped to conquer the wilderness around them. This trail qualifies as an International Mountain Bicycling Association (IMBA) 'Epic', one of only 71 mountain bike trails worldwide to be designated as such. According to the IMBA, a trail must be a “...true backcountry riding experience—one that is technically and physically challenging, more than 80% singletrack, and at least [32-km] in length.” Climbing nearly 915-metres over 35-kms, the technical single-track climbs ridgelines and descends over views of the Columbia River Valley. Over 200-km of the 450-km US-Canadian International Selkirk Loop resides within the Kootenay Lake region. 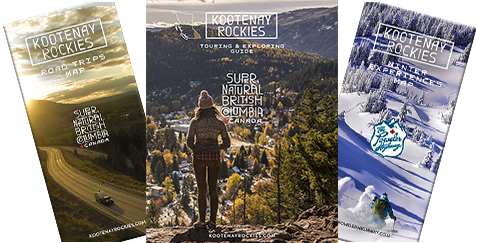 Extend the main route with one of the ‘Super Side Trips’ options and you’ll get even more time in the larger Kootenay region: three of the six options are either partially or entirely within the Kootenays. Either way, your chosen route will lead you through glacial valleys, alongside rivers, past lakesides, and always within view of the Selkirk Mountains. The best time to take this on is before or after high season (late June - August). Tumbling 254-metres in a single stretch and 384-metres in total, Yoho National Park’s Takakkaw Falls is Canada’s second highest falls. To really experience the power of these falls, extend the main walk in on the unpaved trail that ends in a scramble up to the base. You may want to leave an extra set of dry clothes — and your camera — back at the car for this extension; you will get soaked. And it will be worth it. Words by Gina Begin. Cover/top photo by Heidi Korven, at the Bugaboo Provincial Park. Gina Begin - Although she’s a Florida girl, exploration called her away after the final bell of her high school career. On a quest to reach the distant adventures of North America, she lived in her car, traveling to ski the backcountry of Alaska, sleep under the northern lights in the Yukon Territory, ice climb Colorado's frozen canyons, photograph Nova Scotia’s coves, backpack in southern US wildernesses and munch on sugared tamarindo in the jungles of Mexico. But after three years living on the road and seeing the many wonders this continent had to offer, she chose the place she knew would fit an explorer looking for a lifetime of wild wonder: British Columbia. Dual citizenship in hand, she settled along the Powder Highway in the Selkirks and is making her home between four walls and deeply wooded mountains.